This is ATF type, New-Old-Stock in ORIGINAL WRAPS. 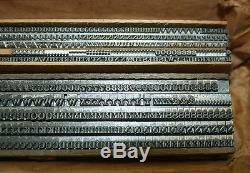 It is hard FOUNDRY-CAST type for letterpress printing. This font is to fragile for HOT-STAMPING. ID: NOS +++ ATF 12pt Engravers Roman Shaded no. This font is COMPLETE AS ISSUED; includes Caps, figures & points. PLEASE NOTE: the last pic shows both the 6 & 12pt sizes for comparison only. This listing is for the 12pt font only. [NB: also listed this face in 6pt, cast by BB&S]. Incredibly, this font is still in its original 1920's PAPER wrapper with its printed pasted label, which is, in its self, a Super Rare Collectors Item. The wrapper is still quite fresh and clean considering it has been in who knows how many printing establishments during the last 90+ years. Moderate wear & tear to extremites of the wrapper. Paper is still flexible and reglets bright and fresh. The printer's fastidious ways preserved the manner in which ATF fonted their types during the 1920's and before. Caps, points & figs were all put together into a single font. Just when ATF started dividing their fonts into caps, lower-case & figures, I do not know. I f you have any info, please let me know. Finding the font intact also shows how the Foundry arranged the scheme and dealt with the several kerning characters. Further , the font has been kept dry over the years and has absolutely no oxidation. The face was hand-cut in steel punch form. I think this was cast in the late'20s as ATF took over BB&S during this time, though they had acquired the company in secret in 1911. This is an example of ATF adding a type to their sales list through acquisition. I could not find this face in the'23 ATF specimen book; it is shown in the 1925 BB&S Specimen. A very rare opportunity for the collector of printing artifacts. I have a few more ATF fonts in paper wraps which also indicate a date from the'20. These too I will list, but none are complete fonts and most of the wrappers are are in rough condition. The lines of type in the font are 6 long, as are all ATF fonts. Personally, I would like to know when American foundries established the 6 foundry line and used the reglet which was slightly taller than type-high for protection. Both probably go back a long way -along with a paper wrapper- and may have migrated from England and/or Scotland, Can anyone provide more info? Will combine other small fonts at no additional Domestic shpg. If the weight exceeds 4-5#, I use a Medium Priority F-rate box, as the small boxes are too thin to safely carry more weight in new type. INFO : I still have a few small Dale Guild fonts from our many years of working together. I also have a few new types that are not yet fonted ; I'm fonting and taking pics as fast as I can but it is slow work. I also have many used fonts to list, mostly cast by ATF & many in series. 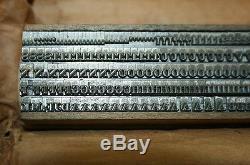 I sell old and new types, type-cabinets & cases, presses, books related to printing and other letterpress things from my own letterpress shop. I have many lightly used series of American & European types in cases for sale. If there is a face that you are looking for, ask. I may have it in relative abundance. In addition, I sell some very nice items types, books & etc. 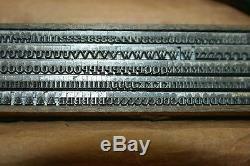 For a few good retired friends that are better acquainted with movable type than computers. Better yet, save my list. I really do appreciate it! Letterpress, font, metal type, foundry type, atf, bb&s. 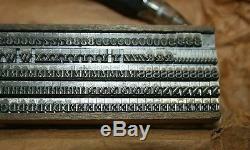 Movable types, gutenberg, goudy, fine printing, private press, hot stamping. The item "+++ATF NOS 12pt Engravers Roman Shaded no. Original 1920's Wraps" is in sale since Thursday, December 29, 2016. This item is in the category "Business & Industrial\Printing & Graphic Arts\Printing & Graphic Essentials\Type, Cuts & Printing Blocks". The seller is "acw" and is located in Fairfield, Connecticut. This item can be shipped worldwide.